1.Edmund Hillary, who reached the summit of Everest with his climbing partner Tenzing Norgay in May 2953, was 34 years old at the time. 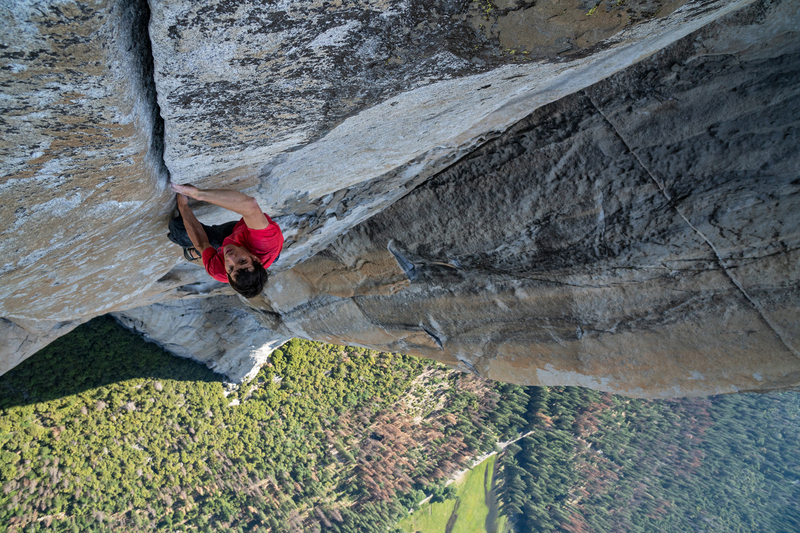 In June 2017, Alex Honnold, a 33-year-old professional rock-climber from Sacramento, California, climbed the vertical rock formation “El Capitan” in Yosemite National Park. El Capitan is notoriously difficult, and no-one has ever attempted to climb this block “free solo” style, without ropes or other apparatus. Honnold has been climbing this way since he was 23, but El Capitan has always been his Mount Everest.1 This would be the first time he climbs it rope-less: a slip of the hand could lead to sudden death. In outdoor climbing, there are three main types of rock: sandstone, limestone and granite. The last dominates the geology of the Yosemite National Park; El Capitan is one massive block of ice-age granite. Standing in the valley, passers-by stare in wonder at the rope climbers who venture to scale the edifice. They wouldn’t imagine that someone would dare to go it completely alone. It seems somehow inhuman to attempt such a thing. Therein lies the “hype” of this film, the sheer idea of it is an immediate attraction, especially for people interested in the sport, but also for anyone who has ever considered the limits of human ability to conquer nature. As an amateur climber, I was excited to see this documentary. Climbing seems like a naturally good theme for film. It ticks all the boxes when it comes to an interesting production, combining suspense and ideas about man versus nature, as well as philosophical musings about life and death and the boundaries between the two. Climbing-related art can be very popular: The Summit of the Gods, a manga about the ascent of Mount Everest, written and illustrated by Jiro Taniguchi, has been hugely successful worldwide. First released in 2016, the manga has now been published in three volumes. The manga is addictive, even browsing through it casually it soon becomes impossible to put down. But while a book can create suspense with the turn of the pages, a film is a different thing altogether. Don’t get me wrong, I think a good film about climbing is almost impossible to make – “except of course, for Herzog”, as most people are wont to say.2 The balance between including real, technical information about rocks and gravity, while also trying to answer the viewer’s questions about the climbers’ psychology, their (un)human need to put himself in such danger, is a delicate one. Unfortunately, this is the case here, and this amazing feat has not produced an amazing film. The first twenty minutes of Free Solo are captivating. As well as Alex’s personal climbing career it considers the history of Free Solo climbing, featuring some of its most famous protagonists and often, sadly, their premature deaths. But it soon veers off track into talking about Honnold’s relationship with his girlfriend. When it brings in the romantic story, the camera seems almost giddy in its joy to bring us insipid shots of Alex lounging with his arm around a woman. It’s as if we were all waiting for a romance to make the story interesting. Once the film starts on Alex’s romance, it’s relentless about it. It even goes so far as to show them visiting houses they’d like to purchase. In an attempt to make him seem more relatable, they’ve created scenes like those out of a bad reality television show. His macho attitude towards his girlfriend is brushed aside, as if to say: this climbing genius should not have to explain himself, but once we see it, we like him a little less. This outpouring of over-the-top staginess outshines the interesting moments of the film from thereon in. Little to no space is left for pure observation. Even during the last fifteen minutes or so, in which he finally actually does the climb, the camera keeps turning away from the rock face to show us one the cameramen, who “can’t watch”. And so the camera flips between Alex climbing, and the producer not being able to watch him climb. Rather than letting the viewer experience their own emotion about the film, they try to force us into affected emotions. The number of times that we’re reminded that “if he falls, he dies”, is also exaggerated: from when I started counting, this statement was made aloud at least four more times. Even the short documentary the director’s made for the New York Times prior to the release of their film is called “What if he falls?”. Despite this, the scenes when we see Alex just climbing are really compelling. There is something magical about him, climbing like an insect – sometimes when the camera is zoomed out or a drone swerves away from a hillside to give a birds-eye view of the cliff, he looks like a small beast, capering up the vertical side of a mountain. Maybe we’re so fascinated by all this because we are really very animal when we climb, only thinking about our immediate fate and nothing else.